Help us celebrate the 40th Anniversary of the Little Crow Ski Team by making this their best attended year yet! 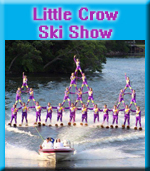 Little Crow Ski Team puts on a weekly show almost every Friday night during June, July and August. Start times are 7:30pm in June and July and 7:00pm in August. All shows are located in the heart of the Little Crow Lake Region, at Neer Park in New London, Minnesota (unless noted). Neer Park is located at 311 2nd Ave. SE in New London, MN. Reserved seating is $8.00. General admission tickets for each show are available at the show site approximately 2 hours prior to each show. Seating for these ticket holders is on a 1st come, 1st served basis with bleachers seats during July and August usually gone 45 minutes prior to the show. These tickets cost $5 for adults and $3 for students. Pre-school is free. Season passes for all of our home shows are available for $35 for adults and $20 for students. You can purchase tickets right from our website! You do not need to wait for tickets to be mailed if you purchase online. Simply print your invoice and present at the gate. You will see all of the major show ski events, including jumping, bare-footing, ballet lines, pyramids, classic doubles and wake-boarding, strap doubles, trios and swivel.